Please ask the Mayor of Ottawa to leave Will Needham's therapy garden alone. i wrote to the mayor & councillor yesterday for Will Needham. Signed w/comment: "Please respect this veteran, and respect this garden, which contributes to his health and well-being. In fact, more people should be encouraged to plant gardens like this". Thanks for this petition, Freya. Tweeted. Signed. This is BS, it should never be illegal to grow food and herbs. Unfortunately I've seen this too many times. With so many going hungry this is insanity at it's height. As one neighbor put it, "There are more things in the world that people should be obsessed with than a small garden." Noted and signed. Thanks Freya. Noted and signed. Thank you Freya. Noted & signed. TY, Freya! My ire & zeal are fired over this. It gives me great satisfaction to sign in support of Mr. Needham. My family is engaged in sustainable non-GMO gardening, we sell @ farmers' markets & provide for CSA customers. My parents' & grandparents' generations grew their own organic food & we lived on home canned food all winter. If we ever are going to take back control of our own food supply from evil corporate giants like Monsanto, all citizens should be involved in raising as much heirloom food as they can muster. Know your food; know your farmer. This situation & many similar others indicates that citizens now must fight raging Food War battles. Consumers MUST have informed choice of what we eat so labels need to stay on food & disease causing chemicals need to stay out of our household meals. Growing your own food used to be considered a sign of freedom & independence by our government officials; now it's a crime? Locavore all the way, my roots are deep in the life giving soil. Signed and noted. Thank you, Freya. Woohoo GOOD NEWS!!! i received a reply from Mayor of Ottawa!!! I’m pleased to tell you that the City of Ottawa and the resident agreed to an amicable solution which will see the garden remain. For context, the City of Ottawa engaged with the property owner following a complaint about a wooden planter next to a public sidewalk, which was over the property line. Under a by-law, the City is required to investigate such complaints for the purposes of public safety and road maintenance work. Following constructive discussions with the residents, the garden box will be moved back from the sidewalk to eliminate any safety concerns. 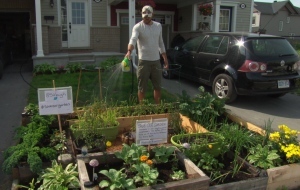 Kanata couple's front lawn garden will survive! This was published on the 10th, very odd because i did search for any news before i wrote to the council. Noted, but did not find a place to sign.